I realise that I am venturing into a different territory with this dish (both with the location and the food type) but this is really one of the best turtle soups that I have tried, anywhere. 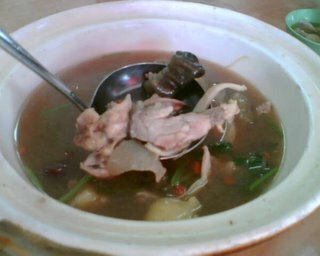 Served piping hot in a claypot, the soup is very well flavoured with just the right amount of herbs. The chewy bits of meat are accented with an accompanying chilli sauce that hints of a dash of white vinegar. I also like the jellied pieces which I am told is the skin. They all go rather nicely with either white or yam rice. Needless to say, we cleaned out the claypot in no time, soup and all. The restaurant (its more like a rather spartan coffeeshop) serves a black chicken soup as well that I have yet to try, in spite of my numerous visits to this place (I just cant not have the turtle soup when I am here). And it appears to be equally popular with the diners. Prices start at S$10 (US$6) for the individual portions and S$35 (US$20) for the claypots.